Here's my 1980s GE GFCI. You can see on these older GFCI outlets, they often had lead wires instead of line screws. Also, the first Leviton GFCIs looked similar to this. The very first Levitons though, had one round and one square button, in the early 70s. The late 70s-early 80s ones had both rectangle buttons with one being red and one black. Then the modern vertical style came out. Eagle also made a GFCI in this horizontal style but the face was flush, and those were made into 2002 or 2003. It's cool how the GFCIs have evolved over the years. They're still very hard to fit into older metal gang boxes you find in almost all older homes that didn't require GFCIs when they were wired. 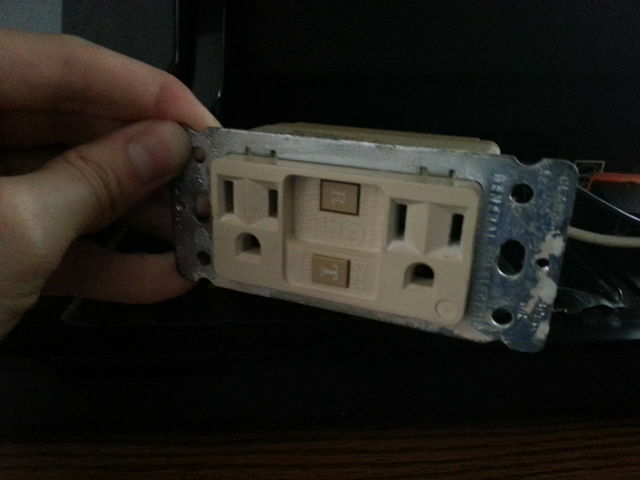 I just replaced the ungrounded duplex receptacle in my grandma's kitchen with a GFCI. The box had three sets of wires (three black, three white, all 14 gauge cloth BX wires). I literally had to force the GFCI into the box using the battery of my drill as a battering ram lol. I had to tape up the terminals on the GFCI to prevent them from shorting to the box. I'm guessing that's why the early ones had pigtails instead of terminals. Fortunately it didn't blow up when I turned the power back on. In situations like that a GFCI circuit breaker is a much better alternative but her whole first floor (lights and receptacles, including the fridge) are on that circuit and I did not want a nuisance trip leaving my elderly grandmother in the dark or spoiling the food in her fridge if her and my aunt went out of town for the weekend or something. Since I could only put two sets of wires on the "LINE" side of the GFCI, (the homerun to the panel and the feed out to other lights and plugs) I had to stick the second feed out to other lights on the "LOAD" side of the GFCI, but only two lights are on the load side and they're infrequently used and won't leave her in total darkness. This is exactly what I bought. It's also a slim, but not slim enough apparently lol. I don't like the colored buttons. The GFCIs in my house are ivory Levitons which look the same as the ones now but no green indicator. I'm not sure if they're self-testing. My house is from 2003, and the GFCIs are all original. Feb 10, 2019 at 07:52 PM Author: Cole D.
I like Levitons best too because of the clean look, but also because they have that green LED that stays on all the time. The P&S ones look a little funny just because I don't see them much and their LED only shows when tripped. Those Cooper ones I like the looks of too. I especially like the ones Eagle made before they got bought by Leviton, they have the sideways plugs. I still see those around here pretty often in ivory and sometimes white. I prefer the color matching buttons too for some reason over the black and red. The green light I think started around 2006. None of the early 2000s ones I've seen have it. Yeah I like the Cooper ones too. I installed one in my other grandparents' bathroom, replacing an older one with the sideways plugs and wire pigtails that stopped working. Looks like this, but not weather resistant. It has a yellow indicator that only comes on when tripped. whatever happened to GE's line of wiring devices? I have some 90s duplex receptacles and toggles that were made one city over from me, in Warwick, Rhode Island. Looks like GE still puts their brand on at least a limited array of wiring devices but I never see them sold or used anywhere and a google search turns up mostly vintage devices. Feb 10, 2019 at 09:13 PM Author: Cole D.
I'm not sure on the GE. At Walmart they sell lots of GE devices as well as night lights, lamp cords, lamp sockets and even fake surveillance cameras, alarms and surge protectors. LOL I'm almost certain none of it is made by GE. The night lights mostly is from Jasco. The porcelain ceiling sockets with pull chain I know are made by Sunlite and they seem better IMO than P&S and definitely Leviton. But they have switched from GE to Walmart's HyperTough brand on those in the last month. I buy the white or brown "GE" lamp cords often to use on fixtures for testing as they're cheaper than the ones HD or Lowes have. I also used to see GE devices sold in grocery stores, especially those screw in adapters that have a pull chain socket and two outlets, and the multi outlet adapters also. Not sure if they still do or not since I haven't looked in that recently. GE like Westinghouse years ago has sold off most of their household lines of appliances, etc and now lighting. And much in stores during the last 15-20 years has just been licensing out their name. I just recently found an old Leviton horizontal pigtail GFCI similar to the one above. Has the rectangular black and red buttons set in a deep square recess in the center. Above the recess is an indicator light, so I guess that's not a new feature. I really like using the modern Leviton GFCIs outside since the plugs are controlled by timer switches, so the lights make it easy to tell if they are turned on or not. Feb 10, 2019 at 10:52 PM Author: Cole D.
Interesting. I've seen one or two like that, but not with a light. That's late 70s/early 80s Leviton then. 1985 and newer use current vertical style. The first Levitons in early 70s were horizontal like that but with one square and one round button instead of both square. I've seen a picture of it but not found any.